At Gold Coast Dental and Denture Centre we provide a certified Thumb Sucking Cessation program for children with non-nutritive sucking habits. If your child is 4 years or older and still using a dummy or digit sucking we provide full health and dental assessment for suitability for our successful cessation program to ensure they achieve the best growth and development of their jaws, faces and body. 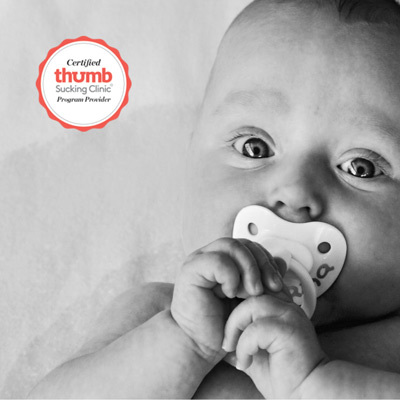 The thumb sucking program is based on positive reinforcement and encouragement. Many children struggle with the difficult battle of quitting this habit and many parents are equally frustrated as well. Many aspects affect the habit and our team will look at these individually and provide a customised program suitable for your child. Book an appointment today with our therapist Imola Foster by phoning 5532 4168. We give advice and tools to help your child wean off dummies at an early age to help them develop healthy habits, faces and jaws. Dummies should only be used as pacifiers when your baby needs it and not all the time so they can develop good speech, feeding and functional habits. Call our practice and book an appointment today with our Oral Health Therapist to discuss your child’s needs and appropriate replacement and therapeutic devices. Gold Coast Dental and Denture Centre has expanded their services for children and now offer pre orthodontic treatment for children of ages 5 - 15 with Myobrace® system. This is a natural way to treat poor oral habits, also know as myofunctional habits, that are the underlying causes of crooked teeth. The treatment is done through a series of removable dental appliances that are worn for 1-2 hours a day and overnight while the children are sleeping. Daily activities to improve breathing, muscle function and tongue posture complete the treatment schedule to improve facial development, resulting in straighter teeth and healthier child. See our trained staff for a complementary consultation for your child’s assessment. To find out more about how Myobrace® works visit the website www.myobrace.com or book an appointment at Gold Coast Dental and Denture Centre and talk to our professional staff. Orofacial Myofunctional Therapy involves an individualized program of facial and oral exercises that are painless and fun. These exercises help activate and guide the coordination of tongue and facial muscles so they function in harmony. The exercises are used to correct tongue and lip functions and at rest postures as well as develop correct chewing and swallowing patterns. Success is ultimately dependant on daily exercise until the patient has subconsciously corrected their improper muscle patterns. It takes constant commitment from the patient, strong parental support and time. In our work we see a significant number of children with restricted tongues or “tongue ties”. A tongue tie limits the movement of the tongue so that the other muscles of the face have to adapt during speech and swallowing. Many children have a restricted tongue that is not picked up early as they have been able to adapt their speech and swallowing at an early age. Tongue tie is defined as ankyloglossia or a frenum. We assess the impact of the tongue tie and if necessary offer tongue tie release procedure with Diode Soft Tissue Laser. Contact Gold Coast Dental and Denture Centre for an appointment if you are concerned about having a tongue tie.